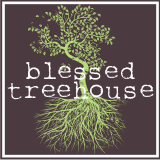 Blessed Treehouse: It's 2012? I'm still blogging about Fall 2011, thankyouverymuch. It's 2012? I'm still blogging about Fall 2011, thankyouverymuch. WAY back in October we spent the day at Matt's parents house with some of our amigos. Shortly before the day was over, we managed to gather up the kiddos and snap a few pictures. In fact, our determination to capture this memory was to the detriment of the baby of the group. See sweet James, the adorable little man in the green sweatshirt? Notice how the series of pictures captures a gradual shift to his right? It was only a second after the last picture was shot that sweet James fell head first INTO THE GRAVEL! Poor buddy. And poor Ella. She later told us, in between tears, "he was getting so heavy." Thankfully James was fine. It was the mommas involved who were most shaken up. I cherish these pictures because the parents of these beautiful children are some of my dearest friends. I pray that we have many many more years of making memories with these precious families. Only slightly less terrifying than last year. Chalkboard Silver Platter - Only $1!! !